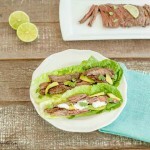 Easy Marinated Grilled Steak Tacos. 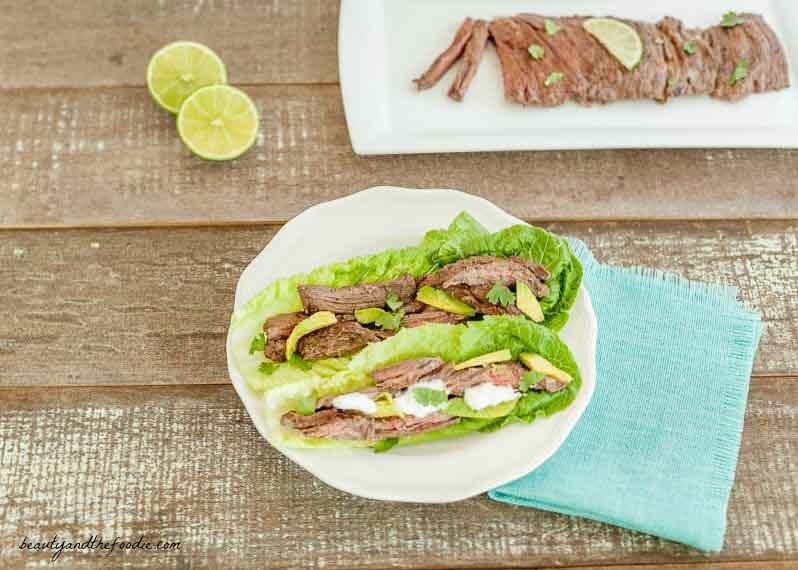 These Easy Marinated Grilled Steak Tacos were so tender and full of flavor! They are grain free, paleo, low carb and super simple, and only have a few ingredients. You can make these with lettuce cups or use any grain free or low carb favorite tortilla you prefer. Also you can make this as a grilled steak without making tacos. I have already made these 3 times in a row, as requested by my family. My husband liked the flavor of the steak in the tacos so much, he requested that I make him just the marinated grilled steak without using it in tacos. These can be made on the BBQ grill, or an electric indoor grill, or stove-top grilling pan. Choice of optional toppings: chopped avocado, chopped tomato, salsa, sour cream, chopped cilantro, and cheeses. In a small bowl combine: lime juice and cumin. Mix together. Place steak in a large pan or dish. Pour some lime marinade over both sides of steak and rub into meat lightly. Cover pan with plastic wrap and refrigerate for 2 hours. Preheat grill or stove-top grilling pan to medium high. Grill steak for about 3 to 5 minutes on each side (depending on thickness and whether you like it medium-rare or medium). Remove from grill and let it rest for 10 minutes before cutting it. Slice steak into small bite size strips. Load into lettuce cup or tortillas and top with optional: salsa, sour cream, cilantro, avocado, tomato or cheeses. 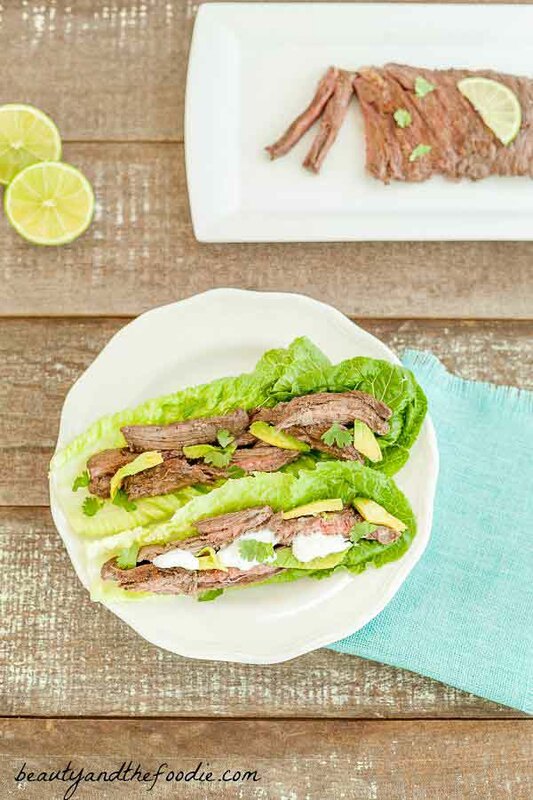 Nutritional Data (includes grilled meat marinade & lettuce cups) : Yield: 6 tacos, Serving Size: 2 tacos out of 6, Cal: 168, Carbs: 1 g, Net Carbs: 1 g, Fiber: 0 g, Protein: 24 g, Fat: 6 g, Sugars: 0 g.
Load into lettuce cup or tortillas and top with optional: salsa, sour cream, cilantro, avocado, tomato, or cheeses.